The North Carolina End-of-Grade (EOG) tests are administered to all students in grades 3-8 statewide at the end of the school year to assess whether they are making adequate progress. The North Carolina End-of-Course (EOC) tests are administered to students to assess their knowledge of subject-related concepts as specified in the North Carolina Standard Course of Study. Currently, students enrolled in the following courses are required to take the EOC tests: Algebra I, Algebra II, Biology, Chemistry, Civics and Economics, English I, Geometry, Physical Science, Physics, and U.S. History. 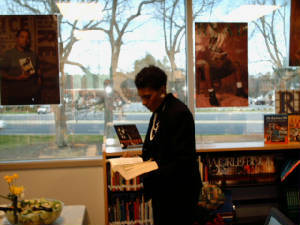 Marva Collins spoke at Knightdale High School in Wake County. The Marva Collins creed governs everything: "I was born to win if I do not send too much time trying to fail.". Click here to view other pictures from the event. In the 2005-06 school year, black males made up 14% of North Carolina’s student population but received 40% of the short-term suspensions. For more information, read the Annual Study of Suspensions and Expulsions from the Department of Public Instruction. Overall, the picture for younger students is bright at Wake County schools. March 6, 2007 – In the Plan for Student Success presented to the Board of Education at its meeting this afternoon, Superintendent Del Burns said the school system is seeking to meet the impact of dramatic student enrollment growth and state-mandated increases. Dr. Burns said the funding of new initiatives were limited recognizing 1) the significant investment Wake County citizens made by approving the November 2006 bond referendum for school construction and 2) any recommendations for change in academic programs will follow completion of the recently approved independent curriculum management audit. Dr. Burns said the school system is seeking to keep pace with thousands of new students entering the schools. Enrollment grew by 7,500 for 2006-07 and is projected to increase by more than 8,000 for 2007-08. The largest increase in funding is in response to growth. The plan includes $16.5 million to open seven new schools and meet the needs of an additional 8,000 students. The new schools opening for 2007-08 include East Garner Elementary, North Forest Pines Elementary, Sanford Creek Elementary, East Cary Middle, Wendell Middle, East Wake School of Engineering Systems and East Wake School of Arts, Education and Global Studies. Legislative changes for salary increases and employer's matching benefit changes require the school district to spend an additional $9.6 million. The plan includes $4.6 million in savings, removing one-time costs from the previous year and budget reductions. The school system receives 61 percent of its funding from the state, 33 percent from local government and six percent from the federal government. The county appropriation that provides most of the local funding totals $305.3 million. That includes the school system request for an increase in the county appropriation of $29.4 million. Approximately 82 percent of the school system’s total funding pays for employee salaries and benefits, and approximately 95 percent of the school system’s positions are school based. The Board of Education will have work sessions in March and April and a public hearing on March 20. The board is expected to approve the plan in late April. (05/14/07 -- RALEIGH) - The Wake County School Board gets new support in its year-round school battle. Some of Wake County's African American leaders are speaking out urging parents to get that consent form - asking parents to choose traditional or year-round calendar schools - filled out quickly. Parent, Martita Williams says, "It's very important for you to at least take a stand and to make a selection one way or the other." More than 30 leaders and supporters in Wake County's African American community not only support the Wake County Public School Board, but urge parents to turn in the consent form before it's too late. Child advocate, Calla Wright explains the important of the forms. "If you don't fill out that form, and say your child is already even in a modified school, your child may be moved out of that school next year." The parent group Wake Cares successfully sued to stop mandatory year round schools. So the board will convert 22-schools to year-round calendars and make them voluntary. Because of the judge's ruling the School Board must notify the parents of 30,000 students that they must decide, with a consent form, whether to send their children to a year-round school or a traditional school. "Studies show that children lose 2.6 months of math and reading computation over the summer months, so I think that it's important that parents weigh the benefits of going to year round schools," Wright said. Supporters say the more vocal critics of year-round schools have been selfish. "Our goal is to look at how the year-round program will benefit all children, not just my child." The consent forms are due Friday, May 18. Parents who choose a traditional calendar are guaranteed a seat for their child, but they won't know which school it will be until June 19. Some parents feel it's a choice between the lesser of two evils, but a former volunteer with a Wake education advocacy group says ignoring the consent form is worse. "If you leave them with a point of having to throw your child into whatever school they can fit them, wherever there's space, that's not the best choice either," Wright said.